I’ve read some beautiful posts about why people write. And like many, I write because I feel the words and need to get them out in order to make sense of my inner workings. For me, it’s the words. The sound of them as they appear, typewriter like, in my mind. And that process is just as powerful for me as a reader. Words are thoughts. And thoughts help me make sense of things. They help me learn. Grow. Change. Mum tells me I taught myself to read when I was around 3 so in my living memory I have never been without a book in my journey. I have no frame of reference for life without books by my side. They have been my friend and teacher always. We were talking at dinner the other night about how every room in our home has books in it. Mr 5, rather seriously said, “We are really very lucky.” And we are. I read as I see my thoughts reflected back. Thoughts I had no words around before those very words appeared before me. The storm is you. Something inside of you. So all you can do is give in to it, step right inside the storm, closing your eyes and plugging up your ears so the sand doesn’t get in and walk right through it, step by step. I read to still my mind, enter another world. It’s not always a comfortable place. I read an article a few weeks ago that said reader of fiction as a group are more empathic. (As an aside, the article makes the distinction that it’s literary fiction that does that and though I tend towards the literary I can’t help that that’s a bit of a snobbish distinction). I have no doubt that seeing the world through the eyes of characters whose lives are far removed from my own experience have made me a better person. I read because it’s part of me. This entry was posted in about me, books, writing on July 31, 2014 by catbeloverly. I’ve just begun reading this book. 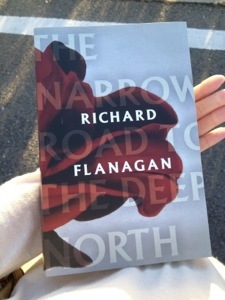 I am a big fan of some of Richard Flanagan’s books, particularly, “Death of a River Guide” which I heard him read passages from at an Adelaide Writer’s Week many years ago. I was captivated by hearing his voice read his words aloud in a way that few writers I’ve heard have been able to do. Words were the first beautiful thing I knew too. Words and the Mona Lisa, which my Mum had cut a small print out of and had placed in our bathroom. I thought, for years, that it was a painting of her as she does have a striking resemblance to my Mum. For me words, and art, have always spoken to my soul. Captured things I’ve not been able to express or put feelings and thoughts I didn’t know I had together. What was the first beautiful thing you ever knew? This entry was posted in books, family, writing on October 9, 2013 by catbeloverly.